A major athletic apparel brand wanted to tap into their target audience to test ad messaging. They worked with Barkley, an advertising agency, to have real discussions with their target audience about what is most relevant to them. Not only did they want quick results, but also results with more depth than just a ‘yes’ or ‘no. 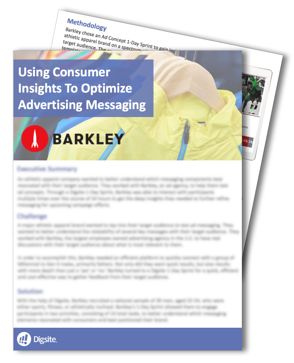 So, Barkley turned to Digsite 1-Day Sprints for a fast, efficient and cost-effective way to gather feedback from their target audience.